Sony BDP-S185 review | What Hi-Fi? Would you be lost without a display on your Blu-ray player? Well Sony doesn’t seem to think so – and just to highlight this, it’s launched a display-free Blu-ray player, the BDP-S185. Scrapping the bright lights on the front has allowed the designers to shrink the unit so it measures just 29cm across. And, with its curved top panel and brushed-effect finish, there’s tiny hint of Sony’s PlayStation 3 Slim games console in there. As you’d expect for such an affordably priced deck, some features have been stripped out. Besides the lack of a display, the machine won’t play SACD or 3D Blu-ray discs, and contrary to earlier reports, the player isn’t DLNA enabled either. On the plus side, the USB socket on the front will let you play back a host of media file types, including Xvid, WMV9 and MKV. The player also comes equipped with Sony’s Bravia Internet Video portal, which means you can access online and on-demand content from the likes of BBC iPlayer and Channel 5’s Demand 5 service as well as Sony’s own services, Movies Unlimited and Music Unlimited. A loading drawer and solitary USB input populate the player’s front panel, while all the basic playback controls are laid out in a line on the top. An ethernet connection and an HDMI output are the main highlights on the rear. The lack of lights on the front, combined with the fact that the remote doesn’t have a backlight, makes for an interesting time when operating the S185 in the dark. Otherwise, the player is simple enough to use thanks to Sony’s intuitive horizontal and vertical-scrolling XrossMediaBar menu system. 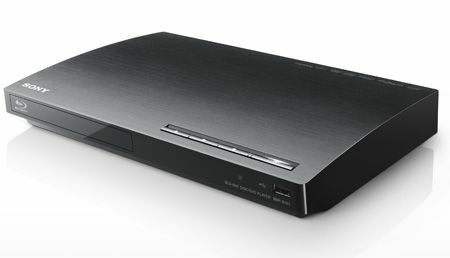 Picture quality is on a par with Sony’s other budget Blu-ray decks, including the £120 Sony BDP-S380. Spin Monsters Inc on Blu-ray and colours are neutral and nicely presented. On-screen noise takes a back seat too, allowing you to appreciate the sharply drawn edges of the colourful characters. Sonically, the S185 sounds a little leaner and harder than other players in the Sony stable. During The A-Team, the action doesn’t quite boast the solidity of, say, the BDP-S380, but it’s rhythmic enough with movie soundtracks, while CDs don’t sound too shabby for a player of this type. If you need a fuss-free player for a second room, which you’ll be connecting straight to a TV, then the BDP-S185 is definitely worth a shout.